The Watts ACV Deep Well Pump Control Valve with Pressure Relief Feature is designed to minimize the surges associated with the starting and stopping of well pumps, and open, relieving excessive pressure, during the pumping cycle. 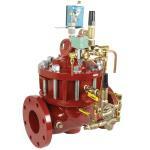 The valve slowly opens and closes as required to control pumping related surges. The pump starts and stops against an open valve.